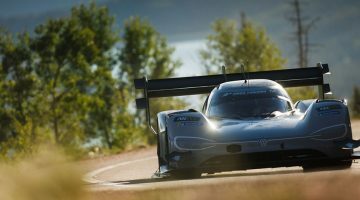 Previewed at the Pôle Mécanique Alès Cévennes race circuit in France earlier this year, Volkswagen’s electric ID R race car has now begun testing on the course the team intends to dominate: Pikes Peak. With the “race to the clouds” now just a few weeks away, the famous hillclimb has now opened for testing, and Volkswagen has wasted no time dropping Le Mans-winner Romain Dumas in the ID R’s driving seat. The team’s goals are clear. Volkswagen wants to wrest away the existing 8min 57.118-second electric course record set by Rhys Millen in his eO PP100 racer in 2016. Whether the ID R will get close to Sebastien Loeb’s stunning 8min 13.878-second time though is another matter, but the car’s electric powertrain does have advantages on the twisting mountain course. 671bhp, 479lb ft of torque and a sub-1,100kg weight are the startling stats posted by the VW ID R, which is said to be capable of sprinting from 0 to 100kph in 2.25 seconds. Unlike the combustion vehicles that also compete at Pikes Peak, the ID R’s figures won’t deteriorate as the air starts to thin with altitude, so Dumas will have as much power under his right foot on the last corner as he had on the first. The car certainly looks dramatic as it fires up the mountain, the LMP1-like form quite unlike most other cars we’ve seen competing in recent years. For Dumas, the silence and lack of gearchanging is also novel – but in the video he praises the car’s rocket-like acceleration out of corners. Our first opportunity to lay eyes on the VW ID R in the metal served up few surprises. By and large, the aesthetic previewed by previous renderings of the car has been carried over but the ID R now looks race-ready, clad in its grey livery. Colour scheme aside, the biggest differences between the computer generated images of the car and the finished version are a collection of aero elements. New winglets, supported on stanchions, have been added to the front splitter, which itself no longer wraps up around the front apron. More aero-honing has delivered the louvered arches and the air inlets located behind the curved windscreen, which will reduce lift and increase cooling capacity respectively. The rear wing is mounted differently from the one on the initial images, too. Despite its LMP1-like shape, the ID R features many of the design cues seen in other ID products, such as the full-width lighting and sloping C-pillar. These design elements will start being seen on the roads at the end of 2019, when VW’s first ID electric car reaches production. 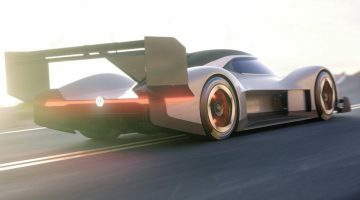 But VW’s effort at Pikes Peak hill climb is also for a slightly more philosophical reason, as this will not be the first time VW has entered the event with a factory-supported race car. In 1987, the company contested a 652bhp twin-engined Golf, which narrowly missed out on an overall win. 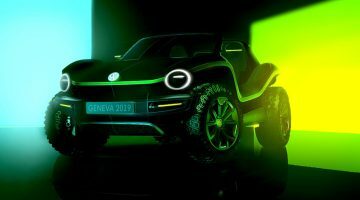 Of the new attempt, VW motorsport director Sven Smeets said, ‘It is about time we settled the score,’ rationalising the amount of effort that the firm has put into this exercise. The bad press generated by dieselgate prompted VW to drop nearly all forms of motorsport to pursue a new, cleaner electric car agenda. As that agenda comes closer to fruition, the ID badge should gain a worthy bit of kudos if Volkswagen does indeed succeed in breaking through that dusty ceiling.